When the editors of the Wall Street Journal Magazine declared in Fall 2009 the new design movement, Rough Luxe, we had no idea it would remain relevant almost five years onward. Imperfection, authenticity, natural rawness, and a certain disdain for anything glitzy was the mantra of Rough Luxe. How has it changed in 2014? Well, metallic finishes are back, especially gold and brass. Even the king of Rough Luxe, Axel Vervoordt, has introduced interiors and furnishings with a more polished look. A little shine is back but still mixed with reclaimed, recycled and found natural elements. 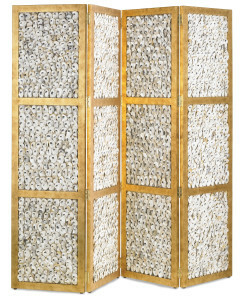 The new Margate Folding Screen exudes authenticity and polish with a gold-leafed wooden frame and hand-assembled oyster shells. A folding screen is an extremely versatile and portable addition to a room. It can add architectural dimension to a space and serve as a functional way to divide or hide a space while creating drama and mystery. The Capri Chandelier is a wonderful mix of tradition and nature. Anchored by a very practical off-white shantung shade, the chandelier is embellished with oyster shells – silver-leafed on one side and the other side left natural. 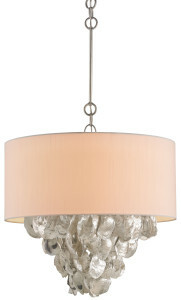 Unconventional and polished, the Capri Chandelier will add originality and functionality to any room. 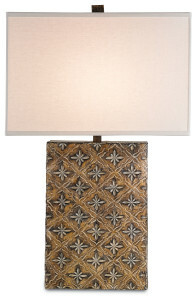 The Spanish inspired carved wooden base of the Santiago Table Lamp is indiscriminately hand-finished in Nero Oro Antico Gold for an authentic and rustic look. Topped with a soothing Bone Linen shade, the Santiago is an exquisite choice. This entry was posted in Currey & Company, Products and tagged Accessories, Chandeliers, design trends, Furniture, Gold, Lighting, Natural, nautical, Oyster Shell, Rustic, Table Lamp, Wood on April 17, 2014 by Currey & Company.